This month is National Sandwich Month. And although exactly how and why that came to be escapes us, it’s as good a reason as any to celebrate a dish truly worth the celebrating. Mendocino Farms — and its six locations around Los Angeles — has carved out a successful sandwich-making niche in Los Angeles. Two more locations are scheduled to open this year and one more in 2014. It’s a recent Tuesday at lunchtime at the Marina del Rey location. A line winds through the shop and out the door, and it doesn’t get any smaller for a couple of hours; the outdoor tables are packed. In one corner sits Mendocino Farms Founder Mario del Pero, sharing his sandwich philosophy: what makes a great sandwich, why people pass other shops to eat at Mendocino Farms and where he can’t wait to open his ninth location. 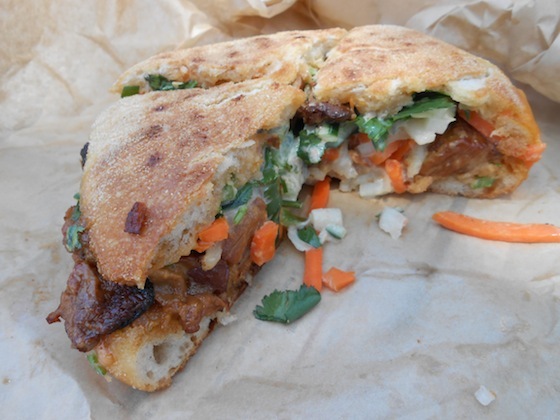 Turn the page, and check out our ode to 31 local sandwiches. It’s always lunchtime somewhere. Squid Ink: What do you think makes a great sandwich anyway? Mario del Pero: The very foundation of a great sandwich is great bread, and crafting the bread to fit the sandwich. We spend as much time working with our baker — which is Celestino Drago’s bakery — as on the sandwich we’re designing. We spent roughly a year developing the wheat bread on the Farm Club.